It's a resource so precious that human life can't be sustained without it, yet so common most of us take it for granted. But water is becoming scarce, a growing problem stemming from wasteful usage and exacerbated by climate change. Cape Town, South Africa, is bracing for Day Zero, when its municipal water supply runs out – likely June 4. Closer to home, Los Angeles endured a record-setting, 3-year drought that ended, just barely, last year, while Georgia and Florida are locked in a long-running Supreme Court battle over access to fresh water in a basin fed by the Chattahoochee and Flint rivers. 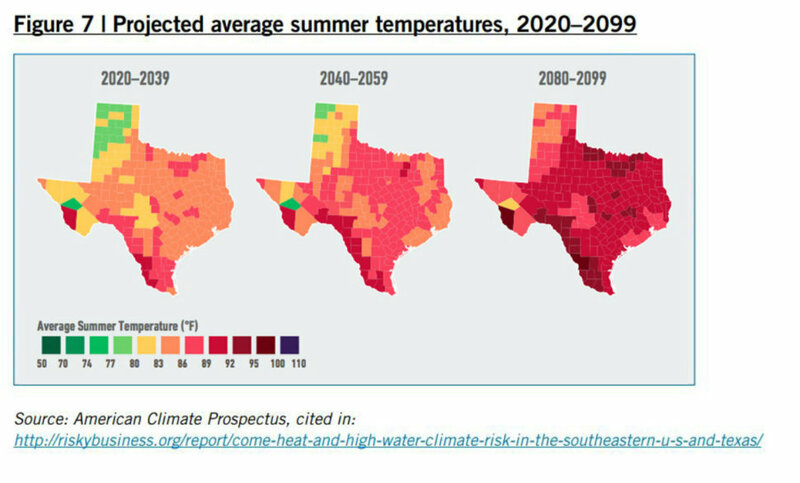 But a new Texas study unveiled Thursday charts a path for states to get ahead of oncoming, inevitable water shortages, triggered by a changing planet and rapidly growing populations. The "One Water" approach recommends integrating different government entities and taking a "holistic" approach, treating all water -- from rainfall to "gray water" left over from household waste treatment -- as a single, renewable, highly sustainable resource. States and municipalities "should consider all waters available in their system and all water needs (including drinking, parks, energy production and delivery, and maintaining natural assets) alongside one another," according to the report, titled, "Advancing One Water in Texas." The One Water approach "avoids the false choice of working for the economy or environment or society," according to the report, produced by the nonprofit Cynthia and George Mitchell Foundation. Instead, the report says, One Water "recognizes the critical importance of sustaining the community's water resources for all audiences and, most importantly, the public good." Carol Howe, one of the report's co-authors, says the water crisis in South Africa and California's struggle are stark reminders that, although water covers 70 percent of the globe, thepotable kind used for drinking and hygiene is a finite resource that's nearly impossible to replace. "People are catching on depending on their situation and what they're facing," says Howe, director ofForEvaSolutions, an environmental consultancy firm. Unfortunately, she says, water conservation "usually gets a push once [states and governments] are facing a crisis, likedroughtor floods." Getting ahead of the problem is crucial for Texas: Analysts predict the state could run out ofwater as early as 2020, while experts project the Lone Star State will add more than 1.7 million new residents by then, according to the report. Cities will take a much larger hit than rural areas, particularly since more people mean more urban development -- building homes and roads on top of grasslands and wetlands that soak up rainfall for the water table. At the same time, the lack of water and a warming planet creates a vicious cycle. "For example, as temperatures rise, demand for air conditioning increases, which in turn increases energy demand, even as the increased temperature makes generating and transmitting energy less efficient," according to the report. Under the One Water approach, Texas authorities would integrate water use across departments, from parks and recreation to waste water treatment, to meet "both community and ecosystem needs," the report states. That means creating a plan to use all sources of water "and manage all waters running through it holistically. This includes rivers and aquifers, wastewater, stormwater, recycled water, and greywater." "The days of feeding vast Texas lawns with water so pure a newborn baby could drink it should cease immediately," and leftover sewage water should do the job instead, according to the report. "The practice of funneling stormwater into concrete culverts should stop as soon as possible" in favor of collecting it, purifying it and storing it for future use. "And, municipal hierarchies that afford the city water utility the right to make water supply decisions independent of the stormwater manager or even the parks department or energy utility should become a thing of the past," according to the report. The departments, it continues, should collaborate on water reclamation -- collecting as much reusable water as possible -- along with planning to use as little as necessary. While some Texas officials agree that conservation should be at the top of the water to-do list, not everyone believes that One Water is the only approach. Six months after Hurricane Harvey devastated the Gulf Coast, Houston is spending billions of dollars buying out homes in the floodplain and building new drainage culverts, but not much has been said about collecting and storing the floodwaters. And while drought has gripped the north central plains, local government candidates are mindful of conservation as an important issue, but they're just as focused on finding new sources of water for their constituents. "I foresee (water) being a huge problem that we're going to have to seek some alternative sources for water or improved technology in how to access the water available to us now," Brit Owen, who's running for commissioner in Bell County, a locality just north of Austin, said at a candidate forum last week. "I don't think there is a single solution that solves the entire problem. I really think we're going to have to be really conscious to preserve and conserve water." The recommendations can seem radical to departments that aren't used to working together, Howe says, but the integrated approach can be healthy for the bottom line -- with proper buy-in from the stakeholders. "The economics have to be clear to everybody," she says. "But if you look at the system [of water use] in total, it makesheckof a lot of sense." At the same time, states may not have much of a choice: Climate change is happening, Cape Town is one of more than a dozen cities around the world facing water shortages, and Texas isn't the only state predicted to run dry within the next decade. According to a NASA forecast, droughts in the Midwest will hit harder as the planet warms, and a 2015 study based on U.S. Drought Monitor data predicts eight states --including Oregon, Washington, Idaho and Montana -- are set to undergo severe water shortages. "I think the timing is right" for the One Water system, says Howe, a native of Australia. "I left the U.S. 25 years ago and nothing was happening" on the water-conservation front. Now, she says, major cities like San Antonio, Seattle, San Francisco and Philadelphia have adopted plans or altered municipal infrastructures to integrate and recycle water use. "I came back five years ago and nothing had moved, and then all of a sudden everything was happening," Howe says. "We have the technology. We just need to get together to solve the problem."